With a number of cultivars available Berberis thunbergii is the ‘Red Barberry’. 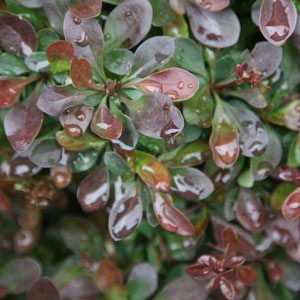 A group or ornamental shrubs or hedging plants they are easy care with a number of cultivars available for sale online. Most cultivars have reddish to purple foliage except for ‘bonanza gold’ and ‘aurea’ which have golden yellow tones. So varieties such as ‘rose glow’, ‘atropurpurea’, ‘concord’ and the smaller growing ‘atropurpurea nana’ and ‘crimson pygmy’ all fit into the ‘red foliage section’. Berberis thunbergii is an excellent hedging plant, also suited for use as a background plant in the garden border. The smaller growing cultivars work well in the border as well as in rock gardens, they also suit containers. B. thunbergii atropurpureum – Spreading shrub to around 1.5m. Purple foliage. B. thunbergii ‘Dwarf Gold’ – Golden yellow to green foliage on a compact bush. B. thunbergii ‘Rose Glow’ – One of the best for foliage ,brilliant vibrant purple new foliage, yellow flowers in spring. B. thunbergii ‘ Silver Beauty’ – Light green foliage with touches of cream that give the plant a silvery look. B. thunbergii ‘Helmond Pillar – With an upright habit and good red foliage this is a useful plant for growing in narrow spaces in front of fences. Reaching around 2m in height it is also useful as a focal point in the garden. Yellow flowers in spring. B. thunbergii atropurpurea nana – Very low growing, useful as a low border plant or ground cover. Berberis thunbergii are forgiving and generally easy to grow plant. They do require a well drained, well mulched soil in a sunny position is best to help promote the autumn colours. Berberis can be trimmed to form a hedge.